Highway projects can take 10 to 15 years from planning through construction. The length of the process leads to cost overruns, some due to inflation, some from having to pay engineers and contractors for years on end. No matter how you feel about the worthiness of road capacity expansion, if a project gets built it doesn’t do anybody any good to have that project cost twice what it ought to because of delays. Plus, reducing delays is going to be a key element in upcoming debates over cost-effectiveness in the transportation sector. House Transportation Committee Chair John Mica (R-FL) has pressed the issue, insisting that the industry, together with government, must find ways to streamline to process to save money. He’s hinted that environmental reviews might, at times, be too burdensome. Rep. John Duncan (R-TN) says U.S. projects take two to three times longer to get off the ground than other developed countries, and he chaired a Transportation Committee hearing today on project delivery delays. Lawmakers and witnesses from transportation companies focused on the National Environmental Policy Act (NEPA) as a cause of the delays. NEPA was enacted in 1970 and in many ways still serves as the foundation for environmental review policies throughout the nation. The first stage, to develop a Purpose and Need statement and the Alternatives for initial evaluation, took four years to accomplish, according to Margro. (Note: his written testimony says it took 28 months.) The second stage, preparing technical studies and environmental measures, he says, took six years. In the end, the National Marine Fisheries Service agreed that the SR 241 project “would not likely adversely affect endangered or threatened fish species” but at the first hint of controversy, they backtracked. Margro says the process has failed them. One alternative is to allow states, rather than federal officials, to do the environmental oversight, as California now does, saving 10 to 17 months in project time. In order to be allowed to do this, states must have environmental protection laws that are at least as stringent as federal ones. One deterrent to states wanting to do their own environmental oversight is that they would lose their “sovereign immunity” and take on the liability the feds would normally have. Rep. Peter DeFazio (D-OR) insisted that sometimes project delays are just due to inefficiency, like one particular case where a project got held up because someone went on vacation. It wasn’t a question of waiving environmental laws, but the bureaucracy was going to grind on for four or six weeks till this guy came back from vacation, went through his inbox and then decided to check the box and send it back to Portland and then it got to the top of the file there and someone decided to check the box and send it on to the Department of Transportation. And by then it might be too late. FHWA Administrator Victor Mendez says the agency has been able to shorten some project delivery times, partly due to his initiative called Every Day Counts, which helps planners and contractors adopt “innovative” technologies and practices to reduce delivery time. Changes to environmental reviews play a very small role in the long list of tools in his delay-mitigation toolkit. Indeed, only three percent of federal highway projects actually undergo an environmental impact statement process, according to Michael Replogle of the Institute for Transportation and Development Policy. He says efforts to reduce delays should focus on diminishing unnecessary and redundant bureaucracy and improving cost-effectiveness. Delays don’t just dog highway projects. They can also slow down transit work. Kathryn Phillips of the Environmental Defense Fund says environmentalists want to see good transit projects go forward without delay. That’s probably one reason you’ll find folks in the environmental community more willing than we’ve been in the past to even talk about NEPA changes through the transportation bill. Our concern, though, is that the conversation not get out of hand and that some people don’t use it as opportunity to just strip away environmental protections. Environmental protections are there for two critical reasons. One, to protect public health and the environment; and two, in this realm, to get to a place where you’re not spending all your time in court. She says that if those who want to see fewer and weaker environmental reviews get their way, they could see even longer project delays – because agencies and contractors will be busy fighting community lawsuits. Great balanced post on an important topic. When we talk to state and local advocates and officials about federal funding for bicycling and walking projects the burden of “red tape” inevitably comes up. NEPA is perceived to be part of the problem. But clearly, as Kathryn Phillips says, we can’t go too far. Can we have a sane conversation about changing NEPA and not live to regret it? I sure hope so. I’m glad they’re using other developed countries as a reference point, rather than going with the usual demagogy about China. Japan and the EU both have vigorous environmental and public reviews, and it makes a lot of sense to see what exactly about the process there is more streamlined than in the US and promotes lower costs and faster construction. Is that Spam in the post above? I think NEPA is good and don’t want real environmental protections stripped away. But it shouldn’t take ten years to build a streetcar or a BRT project on a street that had a line 50 years ago. Sometimes the process is just NIMBY heaven. The Transportation Corridor Agencies of Orange County don’t tell you about the vigorous public opposition, not just from environmentalists, but from cities along the route they are trying to build. Most of the original route was far removed from existing development, hence less opposition. 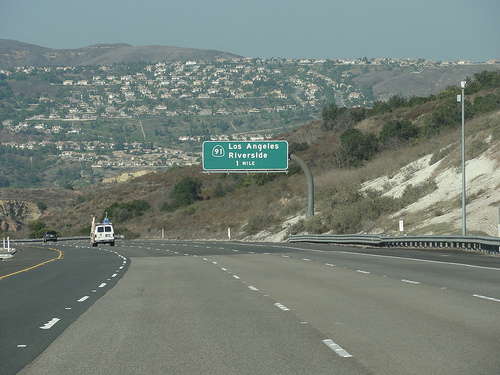 Indeed, the one portion that would have run through an existing community, a new 133 South toll road to Laguna Beach, was dropped altogether – TCA isn’t even including that mileage in its total. Bottom line, it’s not the critters that are stopping the freeway, it’s the people, who don’t want it and don’t need it. This freeway’s main purpose is to enable more sprawl and generate money for the toll operator and construction companies. We have to go through an environmental review for the Expo bikeway in Los Angeles. Enough said. The EIR process is ridiculous. Takes too much time, easy for lawsuits, and so much money is spent. Getting rid of the environmental process would not all of a sudden have massive freeway projects built, I think it would actually speed up our bikeway, transit, and bus infrastructure projects. Due to the time and money, it just delays reasoanble projects. @UnbalancedArticle: I second your comment… and I hope that NEPA fufilled it’s purpose of disclosing those impacts to the public. When does a 15-year “delay” for Transportation Corridors Agency (TCA) result in a dead project? With the current situation in the House and calls for the end of the EPA, I’m a little skeptical that this is the right time for us to be removing environmental protections. Likewise, the reason many of these projects take so long (think 710 gap closure) is that residents don’t want certain projects even though the engineers and 1970’s transportation planners included them in our long range plans. While I agree that this is a slow and sticky process, that is why it’s called democracy. While I agree that NIMBYism is rampant and can destroy many good projects, the same process has been used to stop some really bad projects. So, while I agree we should work towards efficiency, efficiency should not be the final goal. The goal should be environmentally, socially, and fiscally responsible projects that enable access while preventing waste. So if it takes us ten years to refine a project that will be around for fifty years, then maybe that is worth it. Good article overall, but the TCA was the wrong example to cite for all the reasons mentioned above. Those last 16 miles are a political mine field. The environmental review process is working! In that in California it also considers not just wildlife but social aspects. There is a stalemate between pro and anti forces, and Magro is probably loathe to admit the pro side is losing. Also as posters above noted, just because someone drew a line on a map 27 years ago, means that a system is incomplete until that line gets turned into a road. A comment I sometimes make when EIR’s are discussed is: If we had these laws in force 150 years ago, the Pacific Railroad project would not have culminated with the driving of the Golden Spike in May 1869. The Bison Protective League would have raised all sorts of objections, and the various native tribes would have filed suits to keep the white man’s iron horse out of their ancestral homelands. Someone commented on a matter in the Bay Area, saying that all these regulations that “hamstring” projects are the result of being “too progressive”, and that the poor people who in earlier days would just have their neighborhood bulldozed to allow a new freeway to be built as cheaply as possible now have the power to speak up and prevent their lives from being disrupted. Bob, one of the reasons NEPA exists is that before then, governments freely built infrastructure that destroyed nonwhite communities, including the Transcontinental Railroad, which helped destroy the Sioux tribes. The problem with NEPA and CEQA is that they impose a massive, byzantine process on every project with very little in the way of substantive requirements to protect the environment. Disclosure is great, but this is about the most laughably inefficient, counterproductive way of increasing disclosure anyone could think of. 300,000 page EIRs don’t improve public understanding. Perversely NEPA and CEQA can harm the environment by empowering NIMBYs and making infill development and transit too difficult to build. If you build sprawl in the middle of nowhere, you don’t have to worry about NIMBY lawsuits. The completion of the 241 toll road is needed and wanted by the cities surrounding it… that’s why the TCA Board – made up of city council members form Orange County cities – approved the project nearly unanimously. It received every environmental approval except one – the Coastal Commission, which is made up of extreme left wing enviros. Note the end of the article… Enviro-extremists want to control what transportation projects get built (mass transit) and what projects don’t (roads). So they say we can ignore environmental laws when building rail because they are trying to socially engineer our society into using mass transit. These enviros don’t care about traffic relief, they only care about removing our transportation choices because they don’t like the choices the vast majority of commuters make (i.e. cars). Needthe241 – that is a pretty big oversimplification. Unfortunately the real world isn’t that easy. There is plenty of local OC opposition to the 241. It isn’t actually needed at all. The OCTA directs asked consultants to model the impact that not building it would have on the 5 Fwy as part of the South Orange County Major Investment Study (SOCMIS), and they found that the 241 would have negligible impact on traffic on the 5. It would mainly serve areas that haven’t been built out yet. Here is a question for your Orange County politicians (the 241 board). If they want it so bad, and its so needed, why won’t any of those cities allow it to cut through they property? Why won’t San Juan Capistrano allow it to connect to the 74, and widen the 74? It’s desperately needed until you ask them to make a sacrifice for it. If you look at all the cities in Google Earth along the 5 south of Lake Forest you will big master planned communities built within the last 15 years blocking access points from the 241 to the 5, which is why the TCA is focusing on a sliver of park land at the farthest southern point of the county. The TCA got itself into this mess, by assuming, incorrectly, that they would be able to build through a state park, or that Camp Pendleton would give them land even though the Marines said countless times they would not. When you say they got every environmental clearance except the Coastal Commission, it is because they knew all along that the Coastal Commission’s standards would be the strictest, so the TCA gambled that they could line up all their ducks, then the Coastal Commission would be a given. Well the Coastal Commission’s job is to make sure that coastal zone is preserved or enhanced and that is what they have done in this instance. Their job! The TCA gambled and lost.